*Corresponding author. E-mail: [email protected] Tel: +91431-2407082. Fax: +91- 431-2407045. Table 1. Characteristics of electroplating industrial effluent. Value represents mean of triplicates. Values in parentheses represent standard deviation. containing 5 ml of Sabouraud's dextrose broth. The pH was varied from 5 to 9 (5, 6, 7, 8 and 9) by adjusting the SDA medium amended with 25 mg/L of Cu, Cd and Pb. The pH of the medium was adjusted using dil. HCl and NaOH. The biomass concentration of fungal isolates was varied from 1 to 5% (1, 2, 3, 4 and 5) in the SDA medium containing 25 mg/L of Cu, Cd and Pb. The heavy metal concentration was varied from 20 to 100 mg/L (20, 40, 60, 80 and 100 mg/L). The fungal growth was measured using spectrophotometer (Model: Optizen 3220, Mecasys) by measuring the absorbance of biomass at a wavelength of 405 nm. supernatants of the samples were analyzed and the percentage of each metal was determined by atomic absorption spectrophotometer. The experiments were carried out in triplicate and the results are presented as mean values. RESULTS AND DISCUSSION The characteristics of electroplating industrial effluent are listed in Table 1. Heavy metal resistance efficiency In plate diffusion method, results of zone formation indicate the ability of the isolates as heavy metal-resistant or sensitive (Duxbury, 1981). Heavy metal-resistant isolates show no inhibition of growth for higher concentration of heavy metals, whereas heavy metalsensitive isolates show inhibition of growth for higher concentration of heavy metals. Based on this concept, Aspergillus sp., Penicillium sp. and Cephalosporium sp. were identified (Table 2) as efficient strains that were resistant to Cu, Cd and Pb respectively (Figure 1). The identified efficient strains were selected for further studies. In antibiotic resistance test, copper resistant Aspergillus sp. was resistant to flucanazole, itraconazole, ketoconazole and Aspergillus sp. was sensitive to nystatin. Cadmium resistant Penicillium sp. and Pb resistant Cephalosporium sp. were resistant to all three antibiotics except nystatin (Table 3). All these results showed that nystatin was sensitive to all these heavy metal resistant fungal strains. In the present study, fungal isolates were resistant to flucanazole, itraconazole and ketoconazole but sensitive to nystatin. Earlier works revealed that there is an interrelationship between the antibiotic and heavy metal resistance capacities of all the microbes (Harnett and Gyles, 1984; McEnttee et al., 1986; Schwarz and Hobel, 1989; Belliveau et al., 1991). Table 2. Morphological characteristics of the isolated fungi. Figure 1. 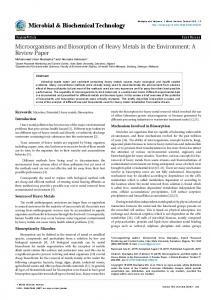 Fungal growth in different concentrations of heavy metal concentrations. A) - Aspergillus sp. resistant to Cu; B) Penicillium sp. resistant to Cd; C) Cephalosporium sp. resistant to Pb. Table 3. Anti-fungal susceptibility of heavy metal resistant fungi. *R- Resistant strain, S- Sensitive strain. Figure 2. Cellular growth of fungi in response to various pH at temperature: 28°C and incubation time: 72 h.
Figure 3. Cellular growth of fungi in response to various biomass concentrations at temperature: 28°C and incubation time: 72 h.
Figure 4. Cellular growth of fungi in response to various heavy metal concentrations at temperature: 28°C and incubation time: 72 h.
Figure 5. Heavy metal remaining after biosorption by fungi. 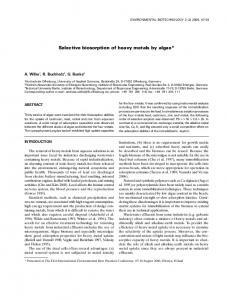 heavy metal reduction capacity possibly due to heavy metal toxicity towards the cells. Biosorption of heavy metal by immobilized fungal cells The biosorption of immobilized fungal cells like Aspergillus sp., Penicillium sp. and Cephalosporium sp. adsorbed Cu (60.94%), Cd (97.21%) and Pb (73.27%) respectively (Figure 5). All these results describe the adsorption capacities of the immobilized fungal cells was greater than that of dead cells. Johncy Rani et al. (2010) found similar adsorption capacity of Cu, Cd and Pb in the immobilized cells of Bacillus sp., Pseudomonas sp. and Micrococcus sp. respectively. Leusch et al. (1995) explained this is because dead fungal cells consist of small particles with low density, poor mechanical strength and little rigidity. Hence, the immobilization of biomass is necessary on before subjecting to biosorption. Holan and Volesky (1994) explained immobilized cells offers many advantages including better reusability, high biomass loading and minimum clogging in continuous flow systems. 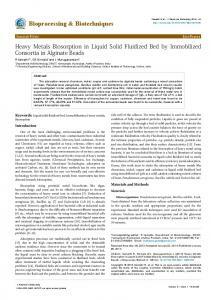 Adsorption of heavy metal was also dependent on cell density in calcium alginate beads. adsorption of 46.91% of Cu, 95.27% of Cd and 70.67% of Pb respectively (Figure 5). The adsorption capacities of these organisms were expressed as Cd>Pb>Cu. 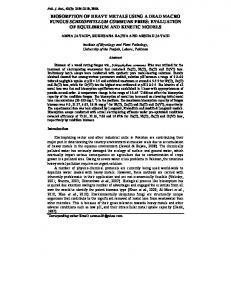 Kratochvil and Volesky (1998) explained the mechanisms involved in biosorption are metal-microbe interactions that should be further studied with great efforts by utilizing various techniques. Baik et al. (2002) reported that Aspergillus sp. has the ability to adsorb maximum level of Cu when treating the cell fraction with NaOH. Volesky and May-Philips (1995) explained this is due to microbial biomass consisting of poor mechanical strength and little rigidity. However, biosorbents are hard enough to withstand the application of pressures, water retention capacity, porous and transparent to metal ion sorbate species. Conclusions The results of this study revealed that all the immobilized fungal cells have a greater potential application for the removal of Cu, Cd and Pb from industrial wastewater than the dead fungal cells by harvesting the fungal cells at log phase to avoid lyses. 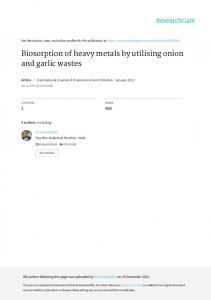 Further research will be scoped to study the desorption process for the management of heavy metal laden biomass as an environmental friendly method of disposal. REFERENCES Alloway BJ (1995). Heavy metal in soils. Second edition, Chapman & Hall, London. Anderson NA, Wang SS, Schwandt JW (1973). The Pleurotus ostreatus sapidus species complex. Mycologia, 6: 28–35. APHA, AWWA, WEF (1998). Standard methods for the examination of water and wastewater. 20th American Public Health Association, American Water Works Association, Water Environment Federation. Baik WY, Bae JH, Cho KM, Hartmeier W (2002). Biosorption of heavy metals using whole mold mycelia and parts thereof. Bioresour. Technol., 81(3): 167-170. Baurer AW, Kirby WMM, Sherries JC, Twick M (1966). Antibiotic susceptibility testing by a standardized single disc method. Am. J. Clin. Pathol., 45: 493-496. Belliveau BH, Staradub ME, Trevor JT (1991). Occurrence of antibiotic and metal resistance to plasmids in Bacillus strains isolated from marine sediment. Can. J. Microbiol., 37(5): 13-520. Diels L, Van der Lelie N, Bastiaens L (2002). 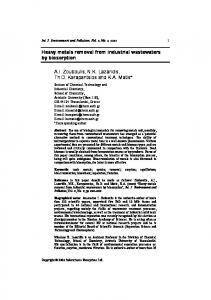 New development in treatment of heavy metal contaminated soils. Rev. Environ. Sci. Biotechnol., 1: 75-82. Duxbury T (1981). Toxicity of heavy metals to soil bacteria. FEMS Microbiol. Lett., 11(2-3): 217-220. Faisal M, Hasnanin S (2004). Microbial conversion of Cr(VI) into Cr(III) in industrial effluent. Afr. J. Biotechnol., 3: 610-617. Gadd GM (1993). Interaction of fungi with toxic metals. New Phytol., 124: 25–60. Geddie LJ, Sutherland WI (1993). Uptake metals by bacterial polysaccharides. J. Appl. Bacteriol., 74: 467-472. Gilman JC (1975). A manual of Soil Fungi. 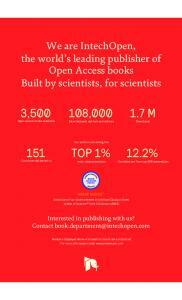 (Pub: Oxford and IBH Publishing Co, New Delhi). Gong R, Dingh Liu Y, Chen Q (2005). Lead biosorption and desorption by intact and pretreated Spirulina maxima biomass. Chemosphere, 58: 125-130. Gourdon R, Bhande S, RUs E, Sofer SS (1990). Comparison of Cadmium biosorption by gram positive and gram negative bacteria from activated sludge. Biotechnol. Lett., 12(1): 839-842. Guillén MF (2003). Multinationals, Ideology, and Organized Labor. The Limits of Convergence. Princeton University Press, p .126. Gulay B, Sema B, Yakup AM (2003). Biosorption of heavy metal ions on immobilized white-rot fungus Trametes versicolor. J. Hazard. Mater., 101: 285-300. Gupta R, Ahuja P, Khan S, Saxena RK, Mahapatra H (2000). Microbial Biosorbents: Meeting challenges of heavy metal pollution in aqueous solutions. Curr. Sci., 78: 967- 973. Harnett NM, Gyles CL (1984). Resistance to drugs and heavy metals, colicin production and biochemical characteristics of selected bovine and porcine E. coli strains. Appl. Environ. Microbiol., 48: 930-945. Hassen A, Saidi N, Cherif M, Boudabous A (1998). Resistance of environmental bacteria to heavy metal. Bioresour. Technol. 64: 7-15. Hussein H, Farag S, Moawad H (2003). Isolation and characterisation of Pseudomonas resistant to heavy metals contaminants. Arab J. Biotechnol., 7: 13-22. Holan ZR, Volesky B (1994). Biosorption of lead and nickel by biomass of marine algae. Biotechnol. Bioeng., 43: 1001-1009. Itoh M, Yuasa M, Kobayashi T (1975). Adsorption of metal ions on yeast cells at varied cell concentrations. Plant Cell Physiol., 16(6): 11671169. Johncy Rani M, Hemambika B, Hemapriya J, Rajesh KV (2010). Comparative assessment of heavy metal removal by immobilized and dead bacterial cells: A biosorption approach. Afr. J. Environ. Sci. Technol., 4(2): 77-83. Kadirvelu K, Senthilkumar P, Thamaraiselvi K, Subburam V (2002). Activated carbon prepared from biomass as adsorbent: Elimination of Ni(II) from aqueous solution. Bioresour. Technol., 81: 87-90. Kiran I, Akar T, Tunali S (2005). Biosorption of Pb (II) and Cu (II) from aqueous solution by pretreated biomass of Neurospora crassa. Process. Biochem., 40: 3550-3558. Kratochvil D, Volesky B (1998). 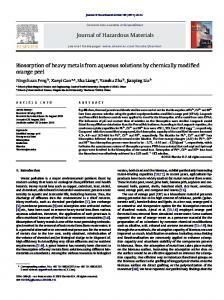 Advances in the biosorption of heavy metals. Trends Biotechnol., 16(7): 291-300. Leusch A, Holan ZR, Volesky BJ (1995). 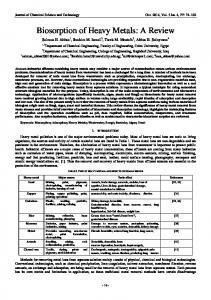 Biosorption of heavy metals in water supplies production of oil industry. J. Chem. Technol. Biotechnol., 62: 279-288. Magyarosy A, Laidlaw RD, Kilaas R, Echer C, Clark DS, Keasling JD (2002). Nickel accumulation and nickel oxalate precipitation by Aspergillus niger. Appl. Microbiol. Biotechnol., 59: 382–388. McEntee JD, Woodrow JR, Quick AV (1986). Investigation of cadmium resistance in Alcaligens sp. Appl. Environ. Microbiol., 51: 515-520. Nasseri S, Mazaheri AM, Noon SM, Rostami KH, Shariat M (2002). Chromium removal from tanning effluent using biomass of Aspergillus oryzae. Pak. J. Biol. Sci., 5(10): 1056-1059. Pal TK, Bhattacharyya S, Basumajumdar A (2010). Cellular distribution of bioaccumulated toxic heavy metals in Aspergillus niger and Rhizopus arrhizus. Int. J. Pharm. Biol. Sci., 1(2): 1-6. 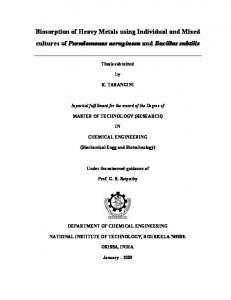 Parameswari E, Lakshmanan A, Thilagavathi T (2010). Biosorption and metal tolerance potential of filamentous fungi isolated from metal polluted ecosystem. Electron. J. Environ. Agric. Food Chem., 9(4): 664-671. Pons PM, Fuste M (1993). Uranium uptake by immobilized cells of Pseudomonas sp. strains EPS 5028. Appl. Microbiol. Biotechnol., 39: 661-665. Prasenjit B, Sumathi S (2005). Uptake of chromium by Aspergillus foetidus. J. Mater. Cycles Waste Manage., 7: 88-92. Rani G, Harapriya M (2003). Microbial biomass: An economical alternative for removal of heavy metals from wastewater. Indian J. Exp. Biol., 41: 945-966. Salehizadesh H, Shojaosadati SA (2003). Removal of metal ions from aqueous solution by polysaccharide produced from Bacillus firmus. Water Resour., 37: 4231-4235. Saxena MM (1998). Environmental Analysis: Water, Soil and Air. 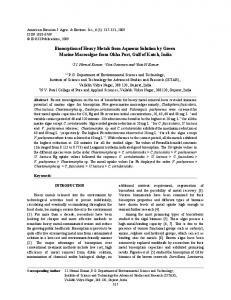 Agro Botanical Publishers, India. Schwarz ST, Hobel H (1989). Plasmid and resistance to antimicrobial agents and heavy metals in Staphylococcus hyicus from pigs and cattle. J. Vet. Med. Educ., 36: 669-673. Selvaraj K, Mononmani S, Pattabi S (2002). Removal of hexavalent chromium using distillery sludge. Bioresour. Technol., 89: 207-211. Shankar C, Sridevi D, Joonhong P, Dexilin M, Thamaraiselvi K (2007). Biosorption of chromium and nickel by heavy metal resistant fungal and bacterial isolates. J. Hazard. Mater., 146: 270-277. Shide EG, Wuyep PA, Nok AJ (2005). 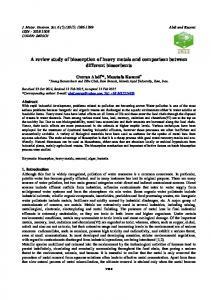 Studies on the degradation of sawdust by Lentinus squarrosulus (Mont.) Singer. Afr. J. Biotechnol., 5: 231-235. Timoney JF, Port J, Giles J, Spanier J (1987). Heavy metal and antibiotic resistance in the bacterial flora of sediments of New York Bight. Appl. Environ. Microbiol., 36: 465-472. Tsezos M, Volesky B (1982). The mechanism of uranium biosorption by Rhizopus arrhizus, Biotechnol. Bioeng., 24: 385. Volesky B (1990). 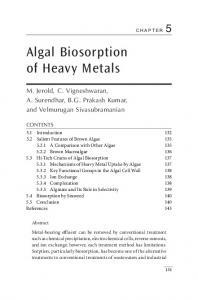 Biosorption and biosorbents: In Biosorption of heavy metals. CRC Press, Florida, pp. 3-44. Volesky B, May-Philips HA (1995). Biosorption of heavy metals by Saccharomyces cerevisiae. J. Appl. Microbiol. Biotechnol., 42: 97806. Wang J, Chen C (2006). Biosorption of heavy metals by Saccharomyces cerevisiae: A review. Biotechnol. Adv., 24: 427-451. Yakup AM, Gulay B, Meltem Y, Sema B, Omer G (2004). Biosorption of 2+ 2+ 2+ Hg ,Cd and Zn by Ca-alginate and immobilized wood-rotting fungus Funalia trogii, J. Hazard. Mater. B., 109: 191–199. Yan G, Viraraghavan T (2003). Heavy metal removal from aqueous solution by fungus Mucor rouxii. Water Resour., 37: 4486-4496. Yi-Tin W, Chang SX (1995). 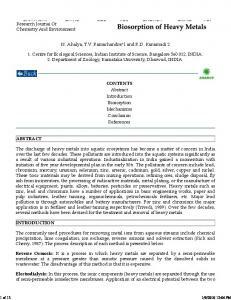 Factors affecting hexavalent chromium reduction in pure culture of bacteria. Water Res., 11: 2467-2474. 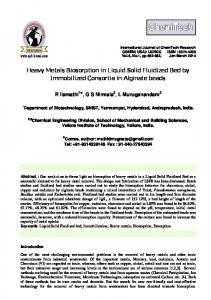 Report "Biosorption of heavy metals by immobilized and dead ..."